Rebuilding Community Infrastructure (Rebuild) is Mayor Jim Kenney’s visionary initiative to invest hundreds of millions of dollars in neighborhood parks, recreation centers and libraries in the City of Philadelphia. Through these investments, Rebuild will improve public spaces, empower and engage communities, and promote diversity and economic opportunity in the design and construction industries. Physical improvements: When selecting which sites to invest in, Rebuild’s primary goal is to promote equity by investing in neighborhoods with high rates of poverty, health risks, or drug crimes. Rebuild is also focusing on sites where investment could help to stabilize or revitalize a community as well as sites that have urgent physical needs. Community engagement and empowerment: Rebuild believes that the voice of residents is vital to the process of investing in a community. Rebuild will work with residents so they can inform what types of improvements will be made to their facility. Rebuild will also make investments to build the capacity of the neighborhood volunteer groups (e.g., friends groups, etc.) 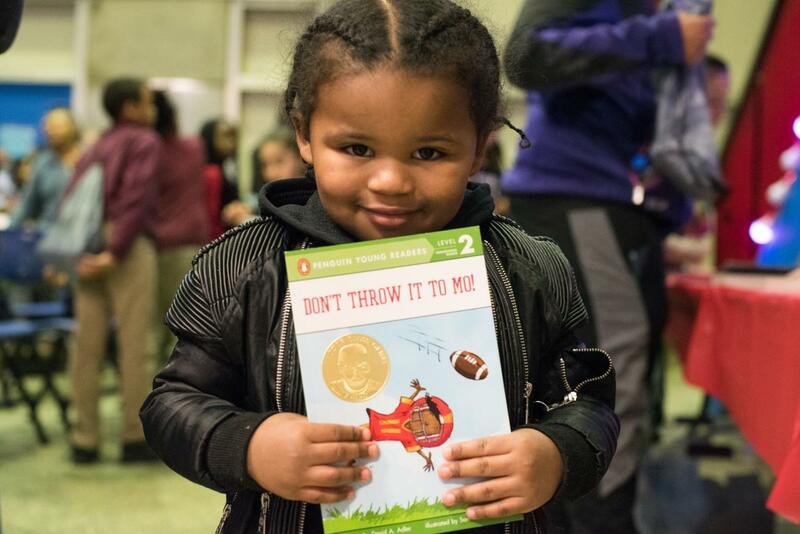 that support the parks, recreation centers, and libraries in their communities in addition to the frontline staff who work with community members every day. Diversity and economic inclusion: If Rebuild is going to transform our public spaces, the people working on Rebuild projects should reflect Philadelphia’s diversity. Rebuild’s goal is to serve as a model for diversity and economic inclusion by hiring local, ensuring that the contractors and workforce on Rebuild projects are diverse, improving access to the building trades for women and minorities, and creating opportunities for small, local businesses to grow. Visit the Rebuild website to learn more about Rebuild’s goals. As a joint public and private partnership, Rebuild will require the support and commitment of both government and philanthropy. To realize its full potential, Rebuild must still raise additional funds. Every additional dollar raised will allow Rebuild to deliver more improvements in Philadelphia communities, serve more people, and grow more local businesses. 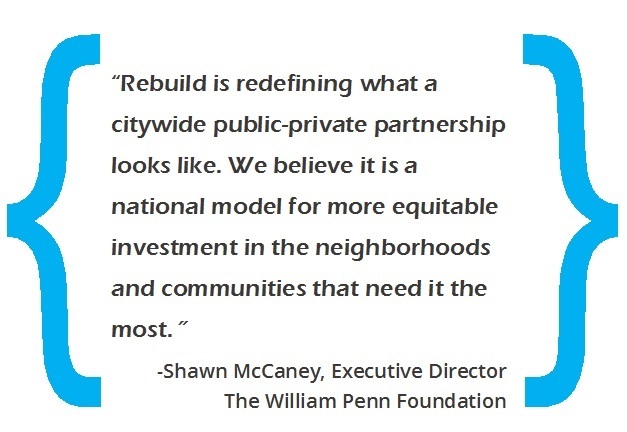 Given the strong interest among members, Philanthropy Network Greater Philadelphia is committed to working with the City of Philadelphia to encourage philanthropic engagement and investment in Rebuild. In 2017, with the support of William Penn Foundation and the John S. and James L. Knight Foundation, Philanthropy Network led the development of the investment framework, guided by the Rebuild Leadership Group, a group of Philanthropy Network members leading efforts to engage the philanthropic community in Rebuild. The first Rebuild sites have been selected and work is underway. See the full list of sites here and visit the Rebuild Map for more information. Rebuild is a large public/private effort that provides funders the opportunity to streamline processes and work collectively toward shared goals. Investment opportunities will cover a wide array of interest areas with relevance to funders, including but not limited to arts and culture, economic development, children and youth, health and wellness, education, environment, civic engagement, and many others. Rebuild will also give funders a chance to provide targeted support to particular neighborhoods of interest. Opportunities will be available for foundations of all sizes and investment capacities. Why should you invest in Rebuild? 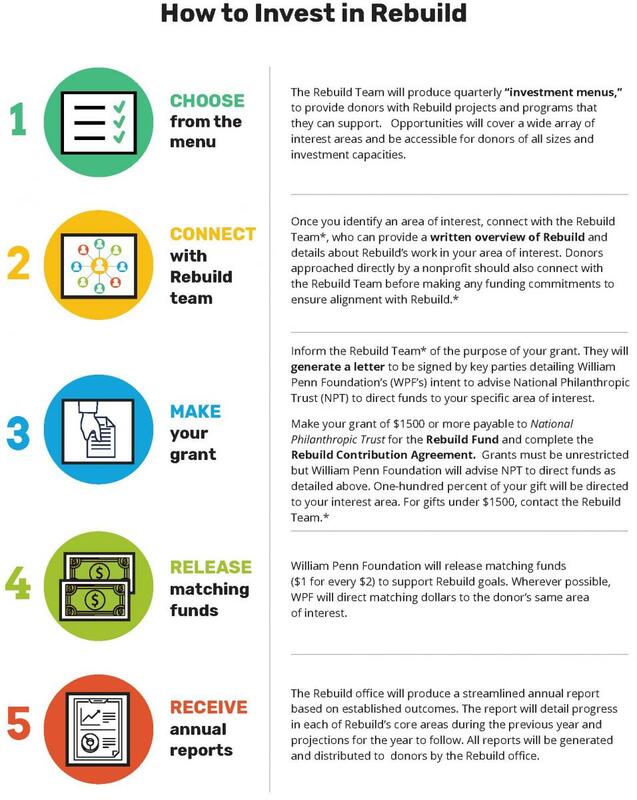 To expand your impact: Rebuild provides a simple and efficient way to be part of a transformative effort for Philadelphia, while directing funds to an aspect of Rebuild that aligns with your foundation’s interests. Oversight and reporting will be streamlined, so donors can see how their funds, when combined with those of others, contribute to a broader collective impact. To increase your gift: The William Penn Foundation will match $1 for every $2 raised in other philanthropic and public dollars for Rebuild, so your dollars will automatically increase in size when you give. To reduce administrative burdens: Making grants through a streamlined process will reduce the administrative burden for nonprofits and donors involved with Rebuild. Multiple accountability mechanisms will ensure that extensive due diligence has been done for you. Do all of the above with no administrative fees. The William Penn Foundation has agreed to cover all fees related to administration of the newly-established Rebuild Fund. You can be confident that 100% of your dollars will be exclusively directed to your foundation’s area of interest. Join these other foundations who have already invested in Rebuild. Purpose: Contingent on the city’s successful issuance of $300 million in bonds. About $4.8 million dedicated for planning and $20.2 million to help draw in more philanthropic and public funding through a 1:2 match. Purpose: To support the City and its nonprofit partners to develop and implement a citywide civic engagement strategy by leveraging Rebuild to have the community lead and participate in the programming and activation of public and civic assets. Purpose: $100,000 in support of laying a firm groundwork for civic engagement in Rebuild by assessing and building the capacity of the volunteer-led Parks’ friends groups. An additional $150,000 will be directed to the pooled fund for community engagement activities. Purpose: To support the community engagement and design process for improvements at Vare Recreation Center. Purpose: In-kind evaluation expertise to support the Rebuild Team on development of an early stage evaluation framework for Rebuild. See below for a step-by-step guide for how to invest in Rebuild. Donors can complete this form to make a contribution to the Rebuild Collaborative Fund, an advised fund administered by National Philanthropic Trust. (Minimum contribution $1,500.) For assistance, call toll-free at (888) 878-7900 or send an email to npt@nptrust.org. * Contact David Gould, Deputy Director of Community Engagement and Communications at David.Gould@phila.gov. Opportunities to invest in Rebuild will be dynamic, driven in large part by Rebuild’s emphasis on community engagement to ensure that community priorities are understood and taken into consideration in the design process. As a result, many investment opportunities will evolve while others, such as opportunities to support Rebuild’s workforce development program, will be ongoing. This page will be updated with investment opportunities as they emerge. Vare Recreation Center serves the Grays Ferry and Point Breeze neighborhoods in South Philadelphia and is home to a variety of beloved neighborhood activities, including basketball and a renowned gymnastics program. The center was forced to close in the fall of 2017 after it was deemed unsafe by structural engineers hired by Philadelphia Parks & Recreation. In December, the first floor of Vare was re-opened after temporary improvements were made to secure the building. Vare will likely be forced to shut down again if more permanent improvements are not made. Funding for Vare will support a brand-new master plan for Vare which will include new plans for the building, fields, basketball courts, and playgrounds. The project will include a community engagement and design process to ensure that the improvements support the programs and activities that are priorities for neighbors. Olney Recreation Center serves the Olney section of Philadelphia. The recreation center is a true community hub offering free and low-cost programs such as after school programs, basketball, football, softball, arts and crafts, cheerleading, Girl Scouts, performing arts, and more. The recreation center has a long list of needs including a new gym floor, roof, and basketball and tennis courts. Funding for Olney will support improvements to the facility through a new master plan which will also include nearby fields at Hammond and Nedro Avenues. The project will include a community engagement and design process to ensure that the improvements support the programs and activities that are priorities for neighbors. Making dowithout a home field to play or practice on has been an unfortunate reality for many of the schools and youth sports leagues in and around the Parkside neighborhood of West Philadelphia. The Parkside Fields project, which will transform space next to Parkside Evans Recreation Center into public soccer and football fields, will change that. Once the project is completed, the neighborhood kids will have both a brand new soccer and football field for practices and games. Funding for Parkside Fields will support the construction of the fields. The designs for the project have already been through the Philadelphia Parks and Recreation’s capital program. Glavin Playground, called “the heart of Port Richmond” by some community members, is one of the most popular destinations for kids in the surrounding neighborhood. Unfortunately, Glavin has a long list of needs including new playground equipment, bathrooms, landscaping, and more. Funding for Glavin will support improvements that will be finalized following a community engagement process. Rebuild is part of the Managing Director’s Office at the City of Philadelphia and works closely with Philadelphia Parks and Recreation and the Free Library of Philadelphia. A list of current staff members can be found on the Rebuild website. Q: How many Rebuild sites will receive investments? There are over 400 sites that could receive Rebuild investments. Visit the Rebuild website to see all of them. Rebuild will improve as many sites as possible, which could be up to 100 or more sites – every dollar raised can help Rebuild reach more sites. Most Rebuild sites will be in communities with high need as exhibited by relatively high rates of poverty, drug crimes, or health risks. The Rebuild Team will work with City Council to select sites. Q: Where will the money come from for Rebuild? Rebuild will be funded through several sources: bonds which will be repaid using revenue from the Philadelphia Beverage Tax; a grant commitment of up to $100 million from the William Penn Foundation; and $48 million from the City’s capital budget. To maximize Rebuild’s impact and the number of sites that will be fixed, Rebuild is seeking to raise up to $52 million from foundations, individual donors, as well as federal and state grants. Q: What are Rebuild’s community engagement goals? These activities will be designed to ensure that residents can inform and shape the improvements at their facility and reinforce and strengthen the sense of pride and ownership of the site. Rebuild will also invest in building the capacity of the volunteer groups that support their neighborhood park, recreation center or library. These groups, such as friends groups or recreation advisory councils, play an integral role in ensuring their facility continues to the community over the long term through things activities like fundraisers, programs, and clean ups. Q: How will Rebuild grow minority, women and disabled-owned businesses? Rebuild will provide a set of supports and services to support minority, women and disabled-owned businesses to help them become more competitive for professional service or construction contracts, starting with Rebuild projects. This program will help small, local businesses become “Rebuild Ready” by helping to connect them to contract opportunities and overcome challenges that may have prevented them from getting work and growing in the past. Q: How will Rebuild provide more opportunities for minorities and women to join the building trades and construction industry? Rebuild will launch two workforce programs as part of the initiative. PHL Pipeline, which Rebuild is developing in partnership with Philadelphia Works, will be a workforce program designed to help minorities and women in Philadelphia neighborhoods start a family-sustaining career. This program will provide paid work experience, test preparation and other supports to individuals who want to work in the construction industry. Rebuild is also working with local construction unions and the Philadelphia Redevelopment Authority (PRA) to create pathways for individuals who have experience in construction but are not part of a union and would like to join. These individuals can be hired by PRA to complete Rebuild projects and, after about 1.5 years of work on Rebuild, can become card-carrying union members. Q: What is the process for site selection? Rebuild will take a data-informed approach to selecting sites. Each year, Rebuild will propose a list of sites to be approved by City Council giving priority to areas dealing with relatively high rates of poverty, drug offenses, and health risks. Rebuild is also seeking to select sites where investment could help to stabilize or revitalize a community as well as sites that have urgent physical needs. Learn more about Rebuild’s data, the selection criteria, and which sites have already been proposed or selected here. Q: When will Rebuild projects start? An initial set of Rebuild projects are expected to launch in 2018. However, most projects will not begin until the Philadelphia Beverage Tax has been upheld by the courts. Q: What about sustainability? How will sites be maintained once Rebuild projects are complete? The work of Rebuild will modernize facilities which will in turn reduce the maintenance burden. The beverage tax will also enable the Parks and Recreation Department to bring on additional permanent skilled trades staff who will increase their capacity to maintain sites. Finally, Rebuild is exploring the possibility of fundraising for a maintenance endowment to help fund ongoing costs related to maintenance of Rebuild sites. Q: How will nonprofits be involved in Rebuild? Pre-qualified nonprofits, called Project Users, will manage most Rebuild projects from community engagement through design and construction. To be eligible to serve in this role, interested local nonprofits must become pre-qualified through a Request for Qualifications process. The RFQ process will be re-opened every one to two years. You can see the current list of qualified Project Users here. Once qualified, nonprofits Project Users will be eligible to apply for grants, subject to approval by the City, to work on selected Rebuild projects. Under the Rebuild Team’s oversight, Project Users will use the grant money to subcontract to partners as needed, which could include partners focused on everything from community engagement to design and construction for Rebuild projects. There is no set number of nonprofits to be qualified as Project Users. RFQ’s will continue to be issued every one to two years to ensure that a wide range of nonprofits serving diverse communities across the city can manage projects in the neighborhoods they serve. Q: How should I respond to nonprofits requesting funding for work related to Rebuild? Funders should direct any inquiries from nonprofits to the Rebuild team. The strong preference is that all fundraising go through the National Philanthropic Trust for accounting, oversight, and accountability purposes. Money going through the National Philanthropic Trust can still be directed to a specific nonprofit or project. Q: My foundation doesn’t usually make grants to “intermediaries.” Why aren't grants being made directly to nonprofits working on Rebuild projects? Rebuild is a large public/private effort that provides funders the opportunity to streamline processes and work collectively toward shared goals. For financial oversight and auditing purposes, funds going directly to nonprofits, and not through the donor advised fund, cannot be comingled with Rebuild funds. However, funders can direct their grant to the nonprofit or project of their choice using the donor advised fund. The William Penn Foundation will help facilitate this and has also agreed to cover all fees related to administration of the donor advised fund, so donors can be confident that 100% of their dollars will be exclusively directed to their nonprofit and area of interest. While this may be different from typical practice for some funders, our hope is that the value of being a part of a larger effort that promises collective impact will outweigh any concerns. Q: What kind of reporting and accountability can funders expect? Rebuild will provide standardized financial reports to individual funders so they can see how their funds are have been spent. Rebuild will also produce an annual report, which will be provided to funders, articulating the progress of each project as well as Rebuild’s community engagement, workforce, and business supports programs. At these meetings, the Rebuild team will provide financial and progress reports that will also be posted on the Rebuild website. The Rebuild office will produce an annual report that will be provided to Rebuild funders. In addition to these reports Rebuild will also provide financial reports to individual funders so they can see how their funds are have been spent. Q: What opportunities will there be for foundations to learn more about Rebuild? Philanthropy Network will host periodic meetings with Philanthropy Network members to share updates about the effort. Please check back for further information or look for updates in the Philanthropy Network newsletter. To learn about Rebuild’s progress and opportunities to get involved, visit the Rebuild website and enter your email address to receive periodic updates. If your foundation would like a member of the Rebuild Team to speak directly to your board or staff about investment opportunities, please contact David Gould at David.Gould@Phila.gov. Sign up for the Rebuild newsletter! View and search available Rebuild contract opportunities anytime on Rebuild's Contract Opportunity Portal.